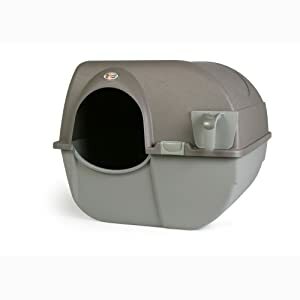 Best Self-Cleaning Litter Box Review: Top On The Market in 2019! 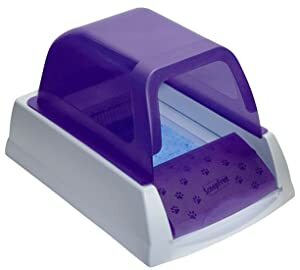 Here you can compare the ten most popular and comfortable automatic litter boxes for cats. Check out their features and advantages and choose a perfect one for your lovely pet. 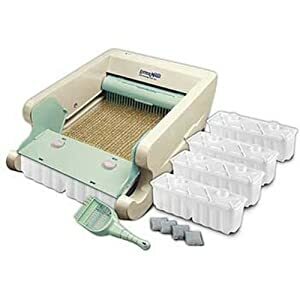 I believed that an automatic litter box isn’t quite a necessary thing for those who aren’t lazy and are used to taking care of their pets. However, after I got Bruno for my birthday, I definitely changed my mind. Why? This little Persian tiger likes to play with his poop! I tried to teach him not to behave in such way but with no success. You may say that cats are considered to be neat and self- sufficient animals (and normally they don’t play with their poop). That’s true. But if you have kids, a lot of homework, or a long working day, you would probably like to be sure that all the business your cats did in a litter box is removed, the floor is clean, and the air smells good. Many cat lovers appreciate automatic containers because they don’t have to scoop poop. Getting rid of this unpleasant procedure is really a great advantage of these modern devices. When choosing a petzone smart scoop container, it is important to consider its size and design. You might be surprised but there are a lot of cases when cats just find these devices not suitable and don’t want to do their business inside. First thing you need to take into accoun, is dimensions. It’s interesting, but these animals might not use the containers not only in case they are too small for them, but also when they are too big. Second, watch your pet and define if it prefers an open-air container, or covered model. Third is design. It shouldn’t be scary or too attractive. Remember its purpose and make sure your kitten is aware of it, too. 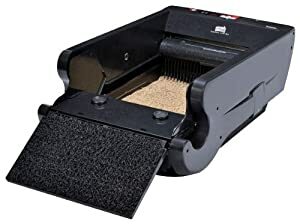 Here you can compare ten most popular and comfortable automatic litter boxes for cats. Check out their features and advantages and choose a perfect one for your lovely pet. This Littermaid model is developed for multi-cat households. So, if you have two or three cats, this item is definitely worth your attention. LM 980 model has really large size: 17.7 x 9.8 x 28 inches. According to the manufacturer, it can easily fit two cats or… one whose weight is over 15 lbs. Littermaid is well-constructed and has reliable drive mechanism. It also features motion-sensitive detectors and a rake, which can be removed. In addition, you will appreciate the side walls, which are tall enough to protect your rug from overfilling or spray. At the same time,the container is supplied with a textured exit ramp in order to assist in disposing any stray residue right from the bottom. No need to waste your time on scooping the litter every morning and every evening. The container can be easily and quickly set up after reading the instruction. All you should know is that the sensor is blocked automatically for 10 minutes minimum while the device is in use. 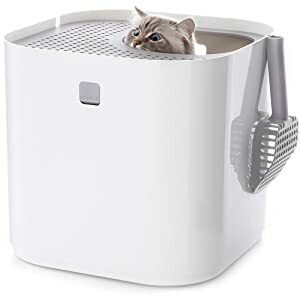 After your cats are done with their business, the sensor is unblocked and the cleaning cycle begins (A special rake moves forward and back to remove clumps into the waste container). Even if the cat returns immediately, the sensor triggers and waits until it leaves a box. 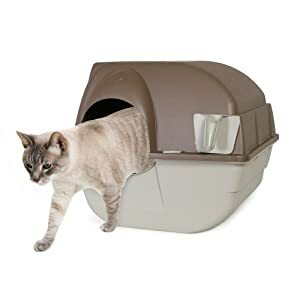 This amazing multi-cat self-cleaning litter box comes with four carbon filters and four waste mini-containers in order to reduce odor and keep cat’s place always clean. There is a removable scraper for easy washing and safety bar to make the rake stop in case of emergency. The device can work with AC adapter and battery backup. A great choice for the house where one small cat lives. It is so stylish and modern-looking, that it can even accomplish your interior. But the main reason I included this item into review – it is able to reduce odor without any scooping or mess. Simply Clean Litter Box is produced for cats, whose weight is under fifteen pounds. The size is 26 x 19 x 10 inches and the weight is 11 pounds. You can easily replace it from the bathroom to the hall or vice versa. Although it has a round shape, it looks great somewhere in the corner near the toilet. So how does it work? A bowl makes a full rotation once per hour. It is enough to get waste sifted out and automatically carried up to a special waste bin, which you can remove any time you want. There is only one thing that you need – a clumping litter. And the device is ready to do all the work for you. This PetSafe model is very easy to set up and to clean. In addition, it can save you money because it does not use as much clumping litter as its analogues. Actually, it saves you time, too. Just imagine how comfortable it is to line waste bins with recycled bags. By the way, according to the manufacturer’s recommendations, it is enough to get the device cleaned two times a month (if you have a single-cat household). You may consider this one to have quite a simple (or even old-school) design. However, Pet Zone device is still chosen by thousands of cat-lovers due to its durability, quiet work, and affordable price. This square-shaped litter-box is made from plastic and metal. It is quite reliable and sturdy, so you don’t have to worry about the situation when a device has been pushed and hidden somewhere by your pet. The designers have taken care of its power (its motor unit provides fast and smooth operation) and comfort for your four-legged friend (the bottom is rugged). Scooping starts fifteen minutes after your cat leaves the box. Basically, it scoops the waste and places into a special collector after the waste-unit has moved across the litter-box. You just need to check the collector, and, when it is full, take off and toss the used waste bag. After that, just replace it with a new one. All the procedure normally takes is a couple of minutes. The manufacturer supplied this model with six “no-touch” plastic bags (you probably will use them within a month), one carbon filter, one rake-cleaning tool, and plastic waste receptacles. Maintenance and cleaning becomes simple with modular parts. If you like smart devices and don’t want to wash your cat’s toilet, this variant would probably be the best. Self-flushing and self-washing features are implemented here to surprise you and your guests. CatGenie is designed for cats older than six months. This model is perfect for one or two cats in the household, who have average weights, heights and length. The dimensions of the item are next: 21x19x16 inches, and 24.5 inches deep allowing for hoses. As for water, the supply hose it is right – eight feet long, while drain hose is ten feet. So all that you need to do is to schedule the clean-time. Just select it via button after setting the time. That’s way how the manufacturer took care of your tiny role in your cats’ toilet business. Be sure – you won’t have the reason to touch the litter-bags or smell the waste. The device is programmed to remove and liquefy the waste for automatic disposal through the drain-system. It uses SaniSolution technology, which is approved by veterinarians and provides safe and easy washing. You will need to connect the device to the electricity and cold water (can be done via simple DIY hookup). With the item you get a box of washable granules which should fill l the container. SaniSolution cartridge is included in the box as well. 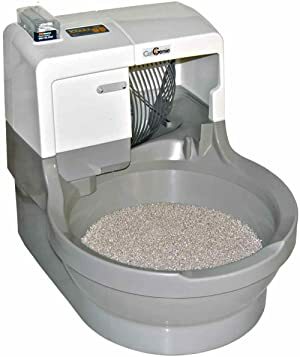 If you were looking for a good cleaning litter box for an affordable price, this might be a perfect choice. Have you ever dreamed of getting such an excellent device for less than 30 bucks? This one has quite a stylish look. Despite its simplicity, Omega Paw offers enough space for an average cat. Its dimensions are 23 x 19 x 18.5 inches, and it weighs only 6.5 pounds, so you can easily replace it if needed. Besides, it seems to be an attractive thing with a hole-shaped door for curious animals. If your pet is shy, it will enjoy the covering design, which provides privacy. 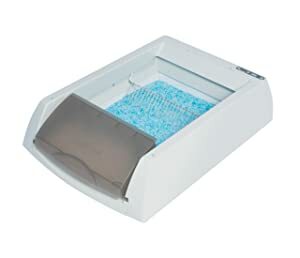 This kitty litter-box is very simple to use. All you need to do is just to open the cover, pour the litter and get back to it after a few days. Then roll the container on the floor right and left in order to start scooping, and push the special drawer out. This part is not very pleasant. However, dropping out waste and washing the drawer don’t take a lot of time. But washing hands after this procedure is necessary. To use this device you will need a clumping cat-litter. You won’t have to change any special bags or filters. At the same time, it has such disadvantages as non-automatic scooping and absence of odor-removing supplies. The manufacturer declares its product can work for weeks with no human interfering. Really great device, yeah? However, it will need some adjustment. Scoop-Free Ultra Self-Cleaning Litter-Box stands as an automatic litter-box, where innovative features have been successfully implemented. It has motion sensors and a disposable tray, which needs to be filled once a month. It can fit even large and fat cats. You will be definitely satisfied with this smart cat-box. In a nutshell, your manipulations include two steps: loading the disposable tray (with pre-filled filled crystal litter-capsules) and plugging the device in. 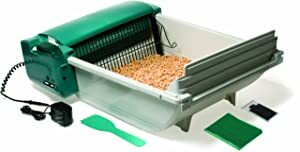 Then PetSafe launches a rake to get the waste into a special container, which is responsible not only for storing the waste but also for controlling odor. The device is supplied with a health-counter to track how many times a day your pet goes to the bathroom. Motion sensors block rake mechanism when cat is in the box. Privacy hood and anti-leaking system keep your home clean and good-smelling. Please note, that this item demands careful usage in case you have kittens under six months or those which produce solid waste. Modkat Top-Entry Litter Box won many awards from different pets brands contests. It was also featured in popular TV shows, papers and magazines such as Animal Planet, New York Times, Forbes, and BuzzFeed. Probably the most beautiful design I have encountered. Every little part of this device seems to be thoughtfully crafted. The lid locks like a walking off mat in order to avoid litter dropping on the floor. Ergonomic handle provides comfortable carrying and replacing. One more thing that is worth your attention is a tarp liner. It is scratch-resistant, easy-to-clean, and, finally, can be an excellent accompiniment to your interior. All that remains after setting up is swiveling and scooping. And even these operations are executed almost automatically. In case some litter remains on the lid, it drops into the container any time lid opens. You can use the liners up to three months. Thus taking care of your cat’s toilet becomes very comfortable and doesn’t take a lot of your time. Modkat provides all the necessary supplements so you won’t worry about buying some additional stuff in order to make the device work. When ordering this model, you also get a full-height base which prevents leaking, easy-opening cover, hanging scoop, and tarp liner which can be used many times. LitterMaid allows your cats to enjoy a clean and comfortable litter box every time they go to the bathroom. No worries about stopping and scooping litters from day to day. If you have a single-cat household and your little bushy hooligan weights less than fifteen lbs, LM580 model can absolutely fit you. Despite its simple construction, LitterMaid is appreciated for its high side walls and reliable drive mechanism. Automatic rake-scooper can be easily removed – it guarantees fast and easy cleaning. Because of quick set-up and auto-cleaning, you get an opportunity to spend less time on dirty unpleasant work, and more – on walks, games and entertainment. Setup is quick and easy and the self-cleaning technology allows you to spend less time in the litter box and more time together. When cleaning cycle begins, rake starts moving forward and back until all the waste went to receptacle. Not all classic models are supplied with sensors but this one is. LitterMaid uses ten motion sensors in order to block the mechanism if a cat is inside. Even after operation starts and pet decides to return, they trigger and stop for ten minutes. So you can be sure your four-legged friend can be safe. Another interesting feature is a sleeping-time mode. You can just deactivate the device till morning comes. If you are looking for a modern self cleaning litter box for a multi-cat household, you’d better choose Nature’s Miracle. It is perfect for two, three, or even four cats. It has an open-air design – no covers, no lids. However, there is a lid, but you would use it only when replacing the container. This is the reason why it can be used by several cats. Nature’s Miracle can clean the waste every time cats go to bathroom so that they wouldn’t smell the wastes of each other. Nature’s Miracle Multi-Cat Self-Cleaning Litter Box provides auto-cleaning and auto-scooping after every act of usage. There are high-quality odor-controlling receptacle and carbon filters which are able to hold the bad smell away from your rooms. In addition, the manufacturer points out on antimicrobial protection. This model supports several types of litter so you can choose the one which your little friend prefers. Among disadvantages; you can see that the lid doesn’t seem to be sturdy and scooping is pretty noisy. Easy cleaning without getting your hands dirty in a couple of minutes. Seems to be a funny joke when talking about cat’s litter box, yeah? However, this Omega Paw model offers you exactly what I said previously. Product dimensions are great even for big cats: 18in x 18in x 20 inches. It can be used by two or three cats. I know households where six fat hooligans go to this box. The drawer where the waste is kept is surprisingly large so you can empty it once or twice a day. Self-cleaning is done by rolling forward and back. A special screen separates fresh litter from the clumped leavings. This way the waste goes to the pullout scoop. Then can be easily disposed. 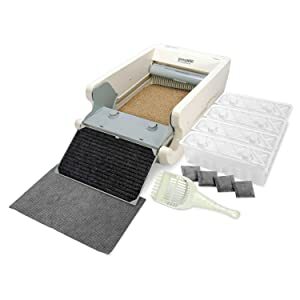 Omega Paw self cleaning litter box is an ideal sample of a simple cat’s mini-bathroom which doesn’t depend on electricity, filters, sensors or other unpredictable stuff. Even though this model is not completely automatic, it provides fast and comfortable scooping. I hope you will find this review useful and choose the most appropriate litter box for your cat and your home. Spend a few minutes reading and save hours of searching information online and visiting pet shops.